Despite sporadic clashes in eastern Ukraine, the heads of Russia, Germany, France and Ukraine have noted “certain progress” in the implementation of the ceasefire between Kiev’s military and the self-proclaimed republic’s forces, the Kremlin said. Russia’s President Vladimir Putin, German Chancellor Angela Merkel, French President Francois Hollande and Ukrainian President Petro Poroshenko discussed the settlement of the crisis in eastern Ukraine in a phone conversation on Thursday. During the talks, the leaders of the so-called Normandy Four group noted a “certain progress in the implementation of the ceasefire and the withdrawal of heavy weapons from the conflict zone” as agreed by the Minsk peace deal from February 12, a statement from the Kremlin press-service said. According to a statement from the French President’s Office, the sides also agreed that at the moment “the truce is an absolute priority” in Ukraine. “Violations of the ceasefire and clashes, in particular in the area of Mariupol, Shchastya, Donetsk airport and near Shirokino must stop,” it stressed. The heads of state also decided that the Contact Group’s four working sub-groups are to meet in the next couple of days. These groups will deal with security, political issues, on economy and issues of refugees and displaced persons. The Normandy Four leaders have also confirmed the decisive role of the OSCE (Organization for Security and Co-operation in Europe) in the implementation of the measures stipulated by the Minsk agreements. In the meantime, the Ukrainian President’s press service has claimed that in the context of consultations on a “peaceful settlement” the leaders also discussed the possibility of deployment of a “peacekeeping contingent” in the Donbass region. Earlier this week, the European Council President Donald Tusk announced that it is “impossible to send a military mission” to Ukraine, reacting to Kiev’s recent requests of such a policing force deployment from the EU. Russia has been reiterating that it is ready to discuss the possibility if both sides in the Ukrainian conflict deem it necessary. However, Foreign Minister Sergey Lavrov earlier noted that within the framework of Normandy Four it was meaningless to deviate from the Minsk agreement and discuss ideas not stipulated in it, especially without the participation of Donetsk and Lugansk representatives. 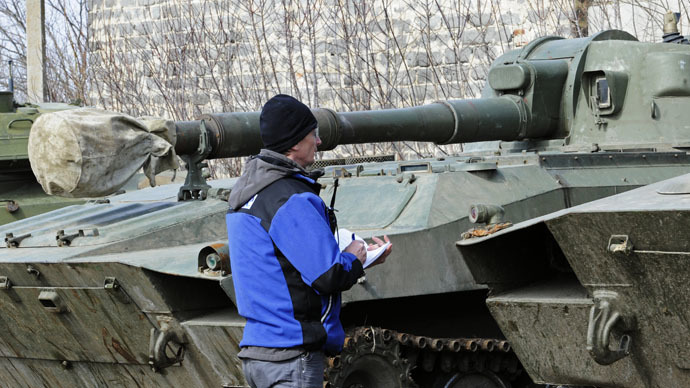 Meanwhile, the spokesman for the OSCE Special Monitoring Mission (SMM) to Ukraine, Michael Bociurkiw, told RT the ceasefire has not been fully implemented byeither side in recent days. Observers have been recording “a lot of reports of quite heavy explosions and fighting, especially, in and around the hotspots of the Donetsk airport and Shirokino,” he said. “Frankly, we aren’t at the place where we expected to be so many weeks after the signing of the second Minsk package of documents,” Bociurkiw stressed. However, the OSCE remains hopeful that “the ceasefire will be respected” by both Kiev and the Donetsk and Lugansk militias and that the day will come when the withdrawal of heavy weaponry will be independently verified. “The only information that goes out is that we report to our 57 participating states every day,” the spokesman added, commenting on the words of Ukraine’s foreign minister, who, earlier this month, blamed the some SMM observers of passing data to the militias. The Ukrainian conflict began in April 2014 after Kiev sent troops to the Donetsk and Lugansk Regions as people there refused to recognize the new coup-imposed authorities in the capital. February’s Minsk accords, brokered by Russia, Germany and France, brought several weeks of peace to the region, but after some time the number of ceasefire violations by both sides started to grow.